The radiographic appearance of air under the diaphragm (generally interposed between the right hemidiaphragm and the liver) is usually a concern for clinicians. Perforated viscus with possible peritonitis comes to mind. Abscesses with gas forming organisms are another consideration. Chilaiditi syndrome is usually a benign condition that can mimic the previously mentioned more serious diagnoses. Less frequently, Chilaiditi syndrome can also have significant clinical implications. We present a case of Chilaiditi syndrome in a critically ill ICU patient. An 86 year-old female was admitted to the Cardiac Care Unit with acute shortness of breath secondary to an exacerbation of systolic congestive heart failure. She had a history of atrial fibrillation, hypertension and dementia. On examination, there were rales in both lungs with jugular venous distension. 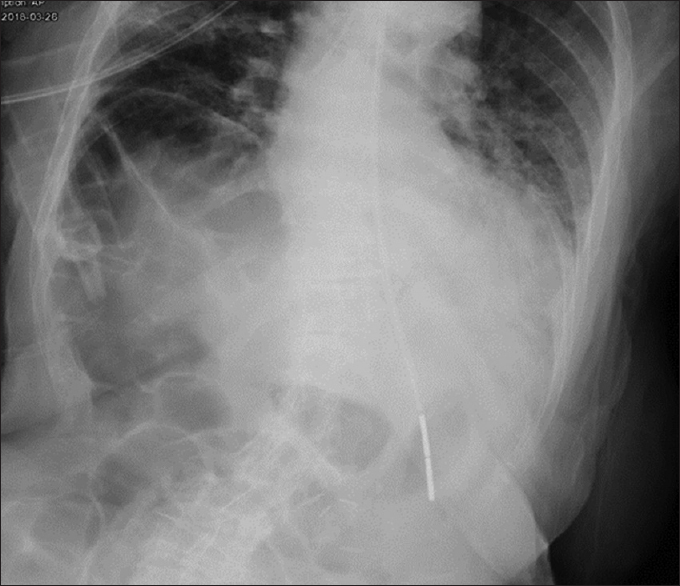 On admission, chest X-ray showed pulmonary vascular congestion consistent with the clinical picture. The patient was treated with diuretics; oxygen; supplementation and her atrial fibrillation rate was controlled with digoxin. Her general condition improved. Two days later, the patient showed signs of abdominal distension, with vague and nonspecific abdominal tenderness. 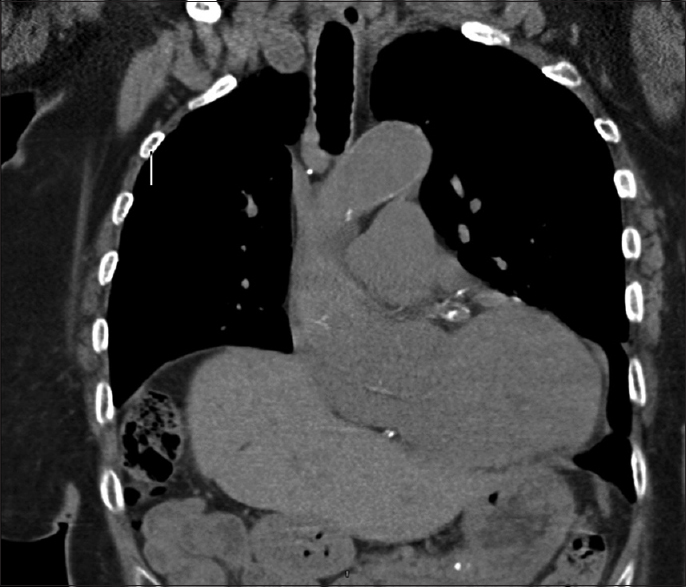 An abdominal X-ray was suspicious for air under the right hemidiaphragm [Figure 1]. A computed tomography (CT) scan demonstrated an interposition of the hepatic flexure of the colon between the liver and the right hemidiaphragm [Figure 2] and [Figure 3]. The findings were consistent with Chilaiditi syndrome. Chilaiditi's syndrome is rare anatomical anomaly, with an incidence of 0.025%–0.28% in the general population. It is characterized by the interposition of an intestinal loop between the diaphragm and the liver. The most commonly involved segment is the transverse colon. When the abnormal findings are present in an asymptomatic patient, it is called Chilaiditi's sign. However, on occasion, the radiologic abnormality may be associated with abdominal pain, vomiting, and constipation when it is referred to as Chilaiditi's syndrome. The radiologic findings in Chilaiditi's syndrome are not always consistently present and may actually be episodic. Our patient had abdominal distention with constipation as the presenting symptoms. Her chest X-ray and CT scan showed colonic interposition between the liver and the diaphragm. Common differential diagnoses for Chilaiditi's syndrome include pneumoperitoneum (air under the diaphragm) from viscus perforation and subphrenic abscess with gas formation. Occasionally, a herniation of the colon through the Foramen of Morgagni can mimic Chilaiditi's syndrome. A CT scan of the abdomen should be used to make the correct diagnosis., Chilaiditi's syndrome is found more frequently in the elderly population, although some cases have been reported in children as well as in young adults. A number of factors may result in this anomaly including an increased laxity of the colonic and hepatic suspensory ligaments, an abnormally long large intestine (dolichocolon), and congenital colonic malposition. Other factors, such as chronic constipation, liver disease, aerophagia, and chronic lung disease, can contribute to the development of this anatomical abnormality. In addition, symptoms may possibly mimic acute abdomen. If clinical symptoms of abdominal obstruction develop, appropriate medical treatment should be initiated. One of the most common complications of Chilaiditi's syndrome is volvulus, which may involve the cecum, transverse colon, or splenic flexure. Although the syndrome is rare, it should be considered in differential diagnosis of radiographic findings suspicious for pneumoperitoneum from bowel perforation. Omeed Moaven MA. Chilaiditi syndrome. Gastroentreol Hepatol Indep Peer Rev J 2012;8:276-8. Taha TA. Chilaiditi syndrome: Correct diagnosis can save the patient from unnecessary and life-threatening surgery. J Adv Surg Res 2018;2. Bell DJ. Radeopedia. Retrieved from Chilaiditi Syndrome; 2018. Available from: https://www.radiopaedia.org/articles/chilaiditi-syndrome. Kurt Y, Demirbas S, Bilgin G, Aydin Y, Akin L, Yildiz M, et al. Colonic volvulus associated with Chilaiditi's syndrome: Report of a case. Surg Today 2004;34:613-5.